Fourteen-year-old Laurent Mailloux spent one afternoon this June collecting his prize at the Montreal Children’s Hospital (MCH). 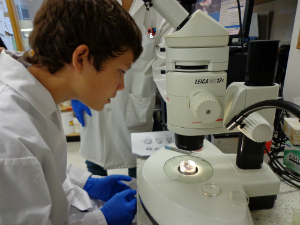 The secondary 2 student at Collège Mont-Royal earned a personalized workshop in Dr. Jacquetta Trasler’s Developmental Genetics Research laboratory along with his Junior Gold medal in the 2013 regional finals of Super Expo-Sciences Hydro-Québec. 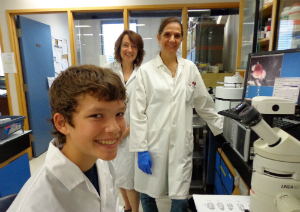 With Josée’s son, Gabriel Lefebvre (age 15), as a lab partner, Laurent learned the techniques needed to perform a hands-on task, the genotyping of four patients’ DNA for cystic fibrosis. Once oriented to the use of the pipette, microscope and molecular weight markers, the two boys conducted agarose gel electrophoresis and gel photography. The unusual prize idea came from MCH physician and researcher Dr. Caroline Quach. A longtime Expo-Sciences judge and this year’s scientific chair of the regional final, she approached Dr. Trasler, the Director of Child Health Research, to sponsor a student prize in the form of an activity at the MCH site of the Research Institute of the MUHC. Dr. Trasler was enthusiastic and offered to host the first annual prize workshop in her laboratory. Dr. Quach, like Dr. Trasler, believes that mentoring future scientists is a special priority for child health research, and opportunities that ignite their interest are needed early on. “I think that given our mission of child health at the MCH – the passion we have for science and mentoring – and knowing what the Conseil pour la relève scientifique accomplishes in underserved areas and schools to help children stay in school and go on to complete a degree, we can bring a lot to the population we serve,” Dr. Quach explained.